Last season Trinity captured their first D-III baseball national championship after a banner season in which they won a school record 44 games with only seven losses, three of which were by only a single score. The Tigers steamrolled the second half of the season, going a perfect 17-0 after losing a series in early April. Those victories included six triumphs in tournament play by a margin of at least five runs. With such a juggernaut of a roster you’d think the Tigers would be a top team headed into the new season, or at least minimally a top 10 club. Nonetheless, Head Coach Tim Scannell’s team isn’t in the running to start a dynasty, quite the opposite in fact. The Tigers are on the outside of the Top 25 looking in to start the year. The 2016 edition of Tigers baseball was a roster full of upperclassmen who spent seasons playing together and developing as individuals and as a team. Their high-octane offense and proficient pitching staff hadn’t been built overnight. When the last out was made in Appleton, Wisconsin, it would be the final appearance for the Tiger’s entire starting lineup as well as three of their starting pitchers. Only three members of the staff are back who provided significant innings and the batter with the most at-bats back totaled only 47. A new champion will be crowned in 2017. Coach Scannell is good, but he’s not that good. It is a wide-open field as to who that champion will be. Some of the usual suspects are back in fine form including Cortland State and Wisconsin-Whitewater, who took home the title the previous two seasons, and Birmingham-Southern and Emory who look scary good on paper, but each has an Achilles’ heel. While that quartet comprises the favorites, considering them head and shoulders above the rest would be overly presumptive. There are a number of very capable teams that could capture the crown this season, including a few quality clubs that are just on the cusp of the Top 25. If a team in the second half of the rankings were to take the title it would be a surprise, but not a shock, not by any means. Following are the top NCAA Division III teams headed into the 2017 season. Coach Joe Brown touts that this year’s club could be the deepest pitching staff he’s had the past decade, and that’s really saying something considering the arms he’s seen. The roster took some hits due to graduation, but the Dragons had a hydra-like infusion of players to take their place with two talented transfers or incoming freshman to replace each loss. The left side of the infield, with shortstop Paul Dondero and third baseman Steven Figueroa, highlight the offense. Redshirt hurler Alex Weingarten, who won nine games with a 2.83 ERA in 2015, Billy Goncalves, a serendipitous transfer from defunct D-II program Dowling, and Jeff Cooke, who excels as both a starter and out of the bullpen, showcase the pitching staff. The Panthers spent the bulk of last season in the top five and the nucleus (as well as some mitochondria and chloroplasts) of that terrific team is back for more this spring. They’re so good that it nearly took a coin-flip to determine if the Panthers or Cortland should be the preseason No. 1. Ryan Gaines, who took home All-American, All-Region, SAA Pitcher of the Year and All-SAA First Team honors is back after finishing 11-2 with a 2.31 ERA last season. He’ll be backed by Stephen Himic whose statistical numbers are nearly as good, if not better. Leading hitter Sam Roberts can’t just hit, but he’s also a national gold glove winner. The Warhawks return eight positional starters and two starting pitchers from a team that reached the final eight. The wheels would have to completely fall off the Warhawks wagon for them not to earn their 10th WIAC championship and 12th NCAA Tournament appearance for Head Coach John Vodenlich. Cal Aldridge, who topped the team in hits, total bases, slugging percentage, home runs and RBI last spring and will be in the heart of the order once again. Austin Jones was selected by the Chicago Cubs in last year’s amateur draft and will be looking to impress and get a call again this spring. With a 34-12 record and third consecutive trip from Atlanta to Appleton, Emory finished fourth in the final rankings. The Eagles seem to be top five lock once again as they return 25 players from last year’s squad highlighted by perpetual All American Jackson Weeg who has a collegiate career 23-4 record and 2.34 ERA. Five seasoned offensive regulars are back, capped by Brian Hernandez, who earned the team triple crown, which will make this team formidable at the plate. The Lakers started last season unranked, but a 23-3 record through mid-April along with a 15-game winning streak exponentially moved them up the rankings and into the top 10. The Lakers won’t be overlooked this season, but they won’t sneak up one anyone either, with much of last year’s surprise team which finished 35-11 back on campus. The club easily has a half-dozen All American candidates on the roster, most notably of which is Eric Hamilton, who topped the team with a .399 average, 13 home runs and 55 doubles to lead the charge. The Scots earned their 16th NCAC championship and amassed 37 wins last season, their highest win total since they reached the national championship game in 2009. With three seasoned starting pitchers and almost their entire lineup back this spring, both those numbers should increase this year. The team retains a trio of All-Region performers from last season, highlighted by Jamie Lackner, one of D-III baseball’s most proven and accomplished hitters who is an example of somebody who has done an amazing job and is getting recognized more and more. Starting pitcher Michael Houdek is the ace of the Fighting Scots’ staff. Over the last two seasons he’s earned the win in 18 games with only three loses. Shenandoah advanced deep into the South Regional championship and would have gotten away with a trip to the D-III CWS had it not been for the meddling kids at Emory who unmasked their weakness with a pair of losses to have their season come to an end. If all goes according to script, SU will meet up with the Eagles in the postseason once again as both teams have definite top 10 talent. While the pitching staff unquestionably has above average ability, Shenandoah’s success this season will be on the back of a spicy starting lineup. The biggest sting for the Hornets will be provided by preseason All American Jake Loew who made baseball diamonds his personal playground as he hit .373 with 15 doubles, seven triples, six home runs and 55 RBI. The Redhawks went from the “receiving votes” portion of the rankings last season all the way into the top 10 as they won the AMCC Conference regular season and tournament titles, along with a school-record 43 games. Despite last season’s success, La Roche Head Coach Chase Rowe believes that this year’s edition of the team will even be better. It will be extremely difficult to slow the Redhawk offensive attack with senior outfielders Luis Navedo and Corey Lazor entrenched in the everyday lineup. Navedo hit .408 with 10 home runs and 19 doubles last year while Lazor broke the school’s single-season hit record with 81 (which ranked seventh nationally) and led the nation with 10 triples. The Yellow Jackets set a program record with 35 victories last season and are no longer ODAC title and regional final virgins as they met those marks as well. The R-MC YJs have the ability to go all the way and more with a team solid on pitching and defense. The return of three of four rotational starters, along with a majority of the bullpen, will make putting the ball into play an uneasy task. When the opposition’s bats do meet the ball it will be a task for the ball to avoid Macon’s top-shelf defense. Coaches are very big on athletic two-way performer Rick Spiers who hit .421 last season while also earning six wins in 12 starts on the mound. The Cougars captured the NACC regular-season and tournament titles but suffered an extra-inning loss in regional play to have their CWS aspirations stymied. CUC will be a favorite to take that next step this season as they return almost their entire offense and pitching staff. The starting lineup is especially potent as they batted .328 as a team last season, capped by Andrew Massey’s .400 average and punctuated with Bryan VanDuser’s 20 doubles and 22 stolen bases. The pitching staff didn’t put up elite numbers but with the additional year of experience, along with the return of Cody Caballero who went a combined 10-1 the two previous seasons, they are poised to have a breakout year. UWL established a single-season school record with 39 wins last season and make their second straight appearance at the D-III CWS. Additional school records set were in batting average, slugging percentage, runs, hits, doubles, triples and RBI. Although two of the top hitters who were crucial in establishing those marks have moved on, the cupboard is far from bare for 2017. Head Coach Chris Schwarz welcomes back four hitters who batted at least .321 and anticipates big seasons from pitchers Caleb Boushley, who earned 10 wins last season with a 2.20 ERA in the offensive friendly WIAC, and Jameson Lavery, who notched eight wins himself while holding opposition to a .250 average. By the end of the season the Eagles may not have the same number of wins as last season but they could have the same talent. The Cardinals made their program’s first-ever appearance in the D-III CWS and earned 39 wins, eight more than Fisher’s previous best. The Cardinals should challenge that number once again as they incredibly return 30 players from last year’s squad, seven of whom were named All-Conference by the Empire 8. While the pitching prowess of closer Loukas Brigham, who earned 10 saves with a 1.73 ERA in 24 appearances, gets the most accolades, the man he fires the ball to, catcher Victor Kostantinovsky, may be the player most critical to the team’s upstart success. Kostantinovsky’s aptitude behind the plate will make him a legitimate pro prospect if he continues to develop on offense. The Tigers were an unexpected success last season, winning their first conference title since 1982 with a program-record 32 wins. With much of the last year’s team back on the diamond those successes could be a launching pad for things to come in 2017. Speaking of launching pads, few players can put the ball into orbit like Oxy’s Devon DeRaad. The senior hauled in a treasure trove of postseason awards last season after batting .414 and finishing second in the nation with 16 home runs. On the mound the Tigers return three pitchers with starting experience, two of which started at least 13 games and each of the trio had a sub 2.75 ERA. The Jumbos had one of their best seasons in school history as they won the NESCAC championship, advanced further than any New England team in the NCAA Regionals and established a new school record with 35 wins for a season in program history. The most critical of batsmen from that team are back as four of their top five hitters return to the lineup. The team also added Stony Brook transfer Malcolm Nachmanoff to give the offense an extra boost. Nevertheless, what could really make this team special is their pitching. In addition to the return of Speros Varinos who limited opposition to a .190 batting average in 67 innings with 79 K’s, three other pitchers are back who pitched at least 37 innings and helped contribute to the team 3.25 ERA. Head Coach Dan Ramsay has a senior laden club which will be unquestionably one of the top teams in the west. The pitching staff is especially astute with towering 6-foot-9 Hugh Smith drawing a lot of attention from pro scouts. Last season he led the team with a 2.57 ERA. He is just one of seven Pirate pitchers back who accumulated at least 20 innings on the hill. The everyday lineup lost only one top contributor from the team that finished in the top five in fielding percentage and broke a school record with 98 doubles. Shortstop Joel Condreay is poised to take his game to the next level after batting .331 last season. The Patriots earned 32 wins on their way to capturing their second straight American Southwest Conference Championship last season. This year the team has a new head coach but the winning ways in Tyler should continue as more than two dozen returners are back from that formidable team. On offense Alex Bishop mercilessly punished opposing pitching last year, batting .407 with 22 doubles and six home runs. He’ll pair like a fine Côtes-du-Rhôn wine to pasta with Trenton Buchhorn who topped the team with 60 RBI, many of which were courtesy of his 30 extra-base hits. Cason Adams, who threw 94 1/3 innings and earned eight wins is the team ace and Reese Read is a bully in the bullpen. The Bobcats won the CAC regular season in 2016 and advanced to the NCAA Regionals where they were ultimately eliminated by Cortland. With a superabundance of talent and a schedule that will test them daily, FSU coaches believe their team has the moxie and ability to advance to the CWS in 2017. Nine pitchers and five position players return from last year’s squad, with an elite player among each group. The staff has Greg Schneider who fanned 91 in only 67 innings while generating a 3.49 ERA. The offense is led by Devin Bell, a .357 hitter who added 13 home runs and 44 RBI to pace the team. The roster also welcomes Logan Corrigan and Colton Sivic, a pair of potential All Americans who could make this good team great. Last season the Saints made their 12th straight NCAA Tournament appearance as they went 15-1 in the UMAC to claim their 20th consecutive conference crown. As impressive as those numbers are they have to be taken with a grain of salt as their conference doesn’t consist of the most formidable of foes. Nonetheless, CSS will have plenty of opportunities to prove they belong with the elite as they have a non-conference schedule filled to the brim with tough adversaries. Taking on those challengers will be a Saints team which returns their top five pitchers as well as eight position players who made at least 20 starts. Brian Minks, who batted .400 with 17 doubles and 14 stolen bases, leads the offense. The Kingsmen finished last season with a palindromic 31-13 record after a pair of narrow defeats in regional play. With two-thirds of the regular pitching rotation back along with an experienced reliever and four top hitters, CLU will once again be a team to beat in the West. The most significant names on the roster are Trey Saito and Gabe Gunter. Saito is one of D-III’s top two-way players as he led the team with 89 innings pitched and eight wins on the mound while serving as team’s catcher (presumably only when he wasn’t pitching). Gunter had 17 multi-hit games and batted .387 while playing flawless outfield. The Bulldogs shared the SCAC regular-season title with national champion Trinity last season and will have back four position starters and two pitching starters for this year’s edition of the club. The player to watch for TLU is Nathan Malinovsky who emerged to earn a 9-1 record with a 1.97 ERA while limiting opposition to a .215 batting average. He’ll be joined in the rotation by Cade Killingsworth who started his college career at the University of Houston. The offense doesn’t have a lot of pop but they’re able to get on base and manufacture runs. Riley Schaefer, who hit .371, and Rayce Gatlin, who batted .365, are the leading returning hitters. They hit for high averages last season but only managed a total of 11 extra-base hits between them in 293 at-bats. The Sea Gulls won their 13th Capital Athletic Conference title last season and advanced to the Mid-Atlantic Regional where they were eliminated in an extra inning loss. Salisbury should be formidable on offense as they return two accomplished hitters in Tom LaBriola and Pete Grasso who each hit well over .400 last season, but graduations caused a significant drop in experienced batters after them. Grasso is also a top pitcher for SU as he split time between the rotation and the bullpen. The pitching staff is a major concern as the team ERA was a near demonic 6.56, which is pretty darn tootin’ lofty, even for the CAC. The Susquehanna baseball team proved to be as difficult to beat as it is to spell as they finished 2016 with a program-record 33 victories and hoisted their second Landmark Conference championship in three years. Expect SU to compete nationally again with a largely intact pitching staff, deep with experience and potential that will help alleviate the loss of some of their most productive hitters. The offense will revolve around Zach Leone, a .444 hitter last season who manages the staff behind the plate. He’ll be rejoined by five other Hawks who received significant plate appearances as well. The injury-riddled Lynx had a disappointing 2016, finishing the year with a respectable 26-19 record, but nowhere close to their preseason projection which had them positioned in the top five. This year much of that group is back, but unlike last season they’re heathy and happy; that, combined with another season of experience under their belt, should make Rhodes ready to compete for a national title. Two players who will factor considerably in Rhodes’ results are Bill Munson and Blake Glauben. Munson hit .422 last season with a team-leading six home runs and 27 stolen bases. Glauben dominated in his five starts, earning the win in four of them with a 1.62 ERA and striking out 41 in 33 1/3 innings. With last year’s national champion Trinity reloading, their conference mate Centenary will have an extra edge in the race for the top of the SCAC standings. The Gents already look good on paper and could be poised for a big season if an additional player or two develops. Their top two pitchers from last year, Jackie Allen and Kaleb Kirk, are back along with closer Matthew Devillier. On offense six regulars return with Michael Schimpf being the most significant statistical performer of the bunch. Schimpf started every game last season and batted .425 and has been an All-Conference performer each year on campus. North Central completed the 2016 campaign with a 31-12 record and their second-straight CCIW regular season championship. With much of the Cardinals’ roster returning to roost, an improvement on those numbers seems likely this spring. 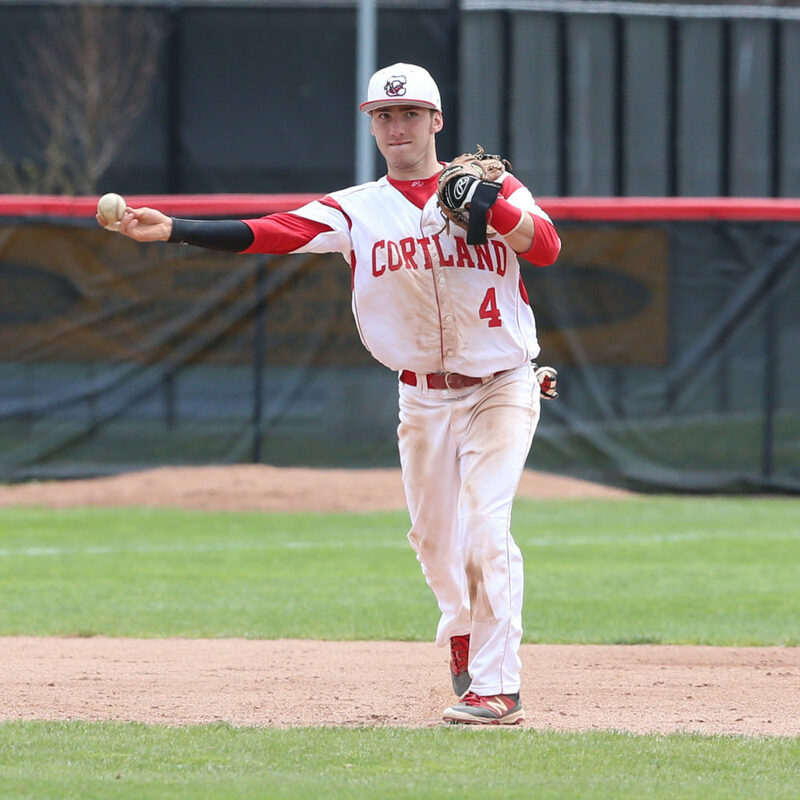 An NCC strength is a quick offense which could surpass the century mark in stolen bases. The leader of the lineup is Nick Sotiros who hit .389 last season with 22 doubles and also led the team in home runs and RBI. Chris Hill’s offensive numbers were nearly as impressive while anchoring a solid defense as catcher. The Knights bullied their way through the Iowa Intercollegiate Athletic Conference last season, earning a 24-4 record in conference play, the best such finish in the annals of IIAC history. While besting that mark would be a surprising accomplishment it wouldn’t be shocking with the crew back on campus. Scoring runs against Wartburg won’t be easy as three returning regulars are back on the mound. Tanner Eckhart was especially dominating, only allowing 44 hits in 62 1/3 innings while striking out 54 and compiling a teeny tiny 1.30 ERA. On offense Jacob Thumann is an elite All American caliber performer. Last season he hit .355 with 15 doubles and a dozen home runs.